The Bottle: My bottle was signed by Robert Maier himself. He put that silver magic marker to it when I purchased the bottle at Wally's in Westwood - for only $22 instead of the normal $34 retail. What a nice guy he was. He and his son were there, pouring their wines and signing bottles for those who were interested. There were a few short but interesting tidbits about the family history - Roy Maier was a member of the Paul Whiteman Orchestra in the Roarin' '20s, f'rinstance. A bargain, a story and an autograph! That's a pretty good deal. This Meritage is a blend of 72% Cabernet Sauvignon, 21% Merlot, 3% Malbec, 3% Cab Franc and 1% Petite Verdot. 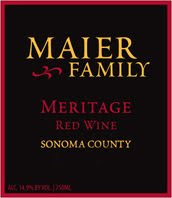 Only 650 cases were produced by the St. Helena Road Winery, which is the name of Mr. Maier's outfit up Sonoma County way. The Nose: Cherries, spices and coffee greet the sniffer. It's a really wonderful smell, full of lush nuances. The Taste: The wine had nice tannins, big and strong. Despite that, it's pretty smooth. It spent 21 months in French oak, and the influence of the wood is noticeable, but not distracting. You'll get a very full mouthfeel and a lingering finish that is quite satisfying. Living in Los Angeles has its good points. One of them is that when it's time to get out of Dodge for a few hours, there are some pretty wonderful places to go. Beaches, mountains, desert, forest - take your pick of pleasures. When it's time for me to get away, one of my favorite locales is wine country. I like the Central Coast. There's something to be said for geographical desirability. A scant two and a half hours from L.A. lies the Santa Ynez Valley. I have really come to love the wines from this beautiful countryside, despite the pun in the title of my blog. I have one colleague in the Santa Barbara area who always needles me that it should be "Now and Pinot." Not a fan of wine puns, apparently. But whatever the varietal, I so look forward to my tasting trips to that magical area. One recent Wednesday came and it was time to get away. But as is often the case, the occasion would not present itself until Sunday. When it did, though, we put Los Angeles in the rear-view mirror until the 101 turned right and all that was around us was wine country. I'll limit myself to the four winery stops we made, although there were many other visits that added a lot of pleasure to the day. For one thing, you should stop at every single farm stand you see. There's still corn available, but the strawberries and blueberries are about done. Apples and pears are coming up, though. 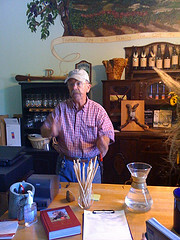 Foley Estate Vineyards and Winery - Bill Foley is the envy of many in the wine business. His vineyards in the limestone-rich Santa Rita Hills are perfectly situated for growing wonderful Pinot Noir and Chardonnay. The beautiful wine country that surrounds his tasting room off Highway 246 provides the perfect locale for sampling those wines. The tasting room itself is pretty nice, too. Chardonnay, Steel 2008 ($28) - There's a tropical nose - star fruit? - and also lime aromas. Clean and crisp on the tongue, well balanced with a very nice finish. Chardonnay, Rancho Santa Rosa 2007 ($30) - 12 months in oak for this one. Apples and pears are on the nose with a great little hint of butterscotch on top of the crisp fruit flavors. It seems more crisp that lush. A buttery finish. Foley & Johnson Dry Rose 2008 ($18) - Rhone blend (Syrah, Grenache, Grenache Gris and Cinsault) is a very pale salmon color. It smells just like a rose! Melon flavors, good acidity, very dry. Medium mouthfeel and finish. A tasting room exclusive. Pinot Noir, Rancho Santa Rosa 2007 ($40) - A medium-deep red color, very pretty. Nose of blackberries and cherries. It's a very full bodied Pinot. Traces of tea on the palate. Good tannins, but very smooth. Pinot Noir, Barrel Select 2007 ($50) - An earthy nose with black cherry aromas. Quite interesting on the tongue, with mushroom flavors and coffee, tea. Great finish. A tasting room exclusive. 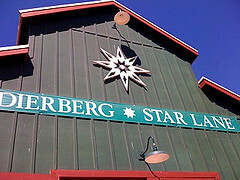 Dierberg and Star Lane Vineyards - Jim and Mary Dierberg planted their first grapes in 1997. The idea was to buy some land either in Napa or Bordeaux. Those areas seemed a little crowded, though, and they fell in love with Santa Barbara County at first sight. Between the Dierberg and Star Lane vineyards, the microclimates are well-covered, from coolest to warmest. That gives Dierberg and Star Lane the flexibility to produce a number of wines from fruit sourced on their own property. The big, green barn is a head-turner and the tasting room occupies about a quarter of it. Star Lane Sauvignon Blanc 2007 ($20) - Very New Zealand. A steel/wood combination, the nose offers floral notes and grapefruit dominates the palate. Good acidity. Dierberg Chardonnay 2006 ($32) - A funky little nose. There's a nutty flavor I really like. Rather heavily influenced by wood. Not a bad thing. Dierberg Pinot Noir 2006 ($42) - Mushroomy minerals on the nose. Earthy taste with nice tannins. Maybe a little rough for some. Star Lane Merlot 2006 ($36) - Coffee and chocolate on the nose. Very nice flavor. 9% Cab Franc, 3% Cab Sauvignon. Dierberg Syrah 2006 ($34) - Very dark in color with a smokey, leathery nose. Tastes of chalky minerals, and blackberry. Yum. Star Lane Cabernet Sauvignon 2005 ($42) - The floral, perfumy nose gives way to a taste of the Old West: dusty sage predominant. Very smooth. 80% Cab S, 15% Cab Franc, 5% Petit Verdot. Star Lane Cabernet Sauvignon "Astral" 2005 ($80) - This reserve cab was a surprise taste. 100%, from the highest part of the Star Lane property. Very chocolatey, rich nose. Smooth, complex taste with earth and coffee notes, lucsious blackberry. Three Saints Cabernet Sauvignon 2005 ($22) - Another surprise taste, not on the menu. Tastes of raspberry, cherry, blueberry. Good structure. Shoestring Winery - I have probably passed Shoestring Winery two dozen times, always on the way to a restaurant or another winery. I made it a point to stop in and visit on this trip. I'm glad I did. The people were nice, the tasting room and the surrounding grounds were comfortable and the wines were tasty. Picnic tables around the corner from the front door were in bright sun when I stopped by in mid-afternoon, but a couple of large chairs in front were shaded by some spreading trees. 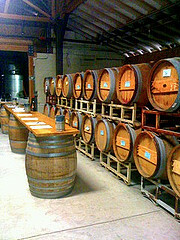 It was nice and cool inside, of course, since the tasting room is actually in the barrel room. Rose 2008 ($22) - Light orange in the glass. Not much acidity, but a lovely flavor is very attractive. Pinot Grigio 2008 ($22) - Flowery with good acidity. Should be a hit with seafood. Sangiovese 2008 ($35) - Outrageous nose! 26 months in oak. Tastes and smells of cherries and smoke. 10% Cab Franc. My favorite. Merlot 2005 ($35) - Cola time! Same oak as Sangio (26 months) but seems a little excessive here. Cab Franc blend. Very soft tannins, quite smooth. Syrah 2005 ($35) - Fruit-forward and oaky (28 months). Very full mouthfeel. They serve it with a square of chocolate, and it's a great idea. Very rich wine. Lincourt Wines - I ended the day the same way I began it, at a Foley property. Lincourt is the little sister winery to Foley Estates. Founded in 1996 by Bill Foley at a former dairy farm, the grounds are beautiful and interesting. The winery and barrel room were once barns, and look it. 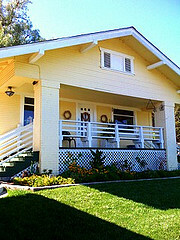 The tasting room is a Sears Craftsman kit home of the 1920s. I'm sure it was a fine farmhouse then. I know it's a fine a tasting room now. The place is charming. Pinot Blanc, Courtney's Vineyard 2008 ($20) - Melon on the nose, nutty at the end, minerals all over. My favorite, although there's a lot of competition here. Sauvignon Blanc, Alamo Pintado Vineyard 2008 ($18) - One of Kris Curran's first vintages for Lincourt. My pourer pointed out that Curran is known for Pinot Noir, but she's also good with white wines. No kidding! Foley and Johnson Rosé 2008 ($18) - The same as the pink from the Foley tasting room: Rhone blend (Syrah, Grenache, Grenache Gris and Cinsault) is a very pale salmon color. It smells just like a rose! Melon flavors, good acidity, very dry. Medium mouthfeel and finish. Chardonnay, Rancho Santa Rosa 2007 ($26) - Plenty of citrus, but nice and creamy, too. Pinot Noir, Santa Barbara County 2007 ($28) - Dark fruit and spices on the nose. Big clove action. Medium mouthfeel, with a creaminess and smooth tannins. 12 months in French oak. Merlot, La Cuesta Vineyard 2005 ($35) - Menthol on the nose? Normally Lincourt blends their Merlot with Cabernet. This one they felt was good enough to stand on its own. I agree. A recent visit to Napa Rose at the Disneyland/California Adventure complex was quite enjoyable, despite the fact that we came without a reservation and had to sit in the lounge area. It turned out to be perfect, as we really weren't all that hungry anyway. In the lounge you can order any of the salads or appetizers from the menu. Perfect, since that's what we wanted. The wines, as expected, were outstanding. I tried a pair. Domaine Tempier Blanc, Bandol, France 2007 This is a very nice wine! The white wines of Bandol take such a backseat to the reds, they are practically in the trunk. Only about 5% of the grapes in Bandol are white wine grapes. Pale golden in the glass, the nose has tons of minerals along with citrus and grassy aromas. It feels full in the mouth with a great acidity. Some pear and citrus come across on the palate, but it it dominated by the minerality. Enjoy a nice, long finish. It's an interesting blend of 58% Clairette, 19% Ugni Blanc, 19% Bourboulenc, 4% Marsanne. Excellent with seared scallops. Dry Creek Chenin Blanc 2007 From an area where they really know how to make a great white wine, this namesake winery in Dry Creek Valley does a great job with Chenin Blanc. Aromas of honeysuckle and tropical fruit capture the nose. The pale wine is crisp and refreshing, with ﬂavors of tart apple and melon. The acidity is great, perfect for food, and the finish is pleasing. My wife and I enjoy the appetizers-in-the-lounge experience so much, that's where we've been found on our last few visits to Napa Rose. If you are really hungry, though, you should opt for the dining area where you can order entrees. It was an unplanned day today. We just hopped in the car and started driving, making it up as we went along. Nearly every move we make has some sort of plan behind it, so it's nice sometimes to just go where the car wants to go. Today it wanted to go to Beverly Hills for breakfast at Il Fornaio. Delicious. I had that little Italian sausage all coiled up next to some scrambled eggs. My wife had the eggs Benedict, Italian style. Side of raisin bread. Mmm mmm. Sorelle Bronca Prosecco, from Venice - Citrus on the nose with a nuttiness on the palate I found quite engaging. Minerals and Melon abound. Niedrist Terlaner Sauvignon - From Alto Adige, this expressive white has a very funky nose with a sort of petrol aroma. A bit of that comes through in the taste, as well, with a grassiness on the medium finish. Stainless steel. Vallevo Montepulciano D'Abruzzo - Very nice nose, rather like cinnamon or cumin, very spicy. There's a dark fruit taste with an earthy edge. Not much finish, but nice while it lasted. 100% Montepulciano. Germano Ettore Langhe Nebbiolo 2007 - Declassified Barolo. Light red with a perfumy nose; clove. Rather lightweight for Nebbiolo. Bright, easy drinker. Tenute di Sella Lessona 2004 - Medium red with a vanilla nose. Rather earthy and a nice finish. Sella Lesona San Sebastiano Allo Zoppo 2003 - Reserve bottling of the previous wine. Medium heft, vanilla and blackberry nose, very smooth taste, decent acidity. After the tasting, we pointed the car in the general direction of Surfas in Culver City. The wife picked up a few items I could try to tell you about, but I don't really understand them. I'm happy to merely find them in the finished product she brings out of the kitchen. Then we tried to go to Downey. Our friend Siouxie calls these sort of excursions our "adventures." Well, we ended up in Anaheim. 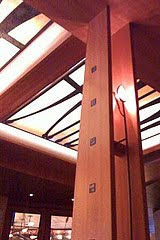 A sudden desire for appetizers at Napa Rose in the Grand Californian Hotel overcame us. If you have never been to the Grand Californian, and if you have even a passing interest in architecture inspired by the Arts and Crafts movement, you should not let the Disneyland location deter you. Entry into Disneyland is not required. Great scallops, a fantastic sampler platter featuring pork ribs that fell - no, jumped - off the bone, shrimp with a black bean and garlic sauce and skewered chicken provided the dining portion of the visit. I had a dry Riesling, Pfeffingen Pfalz 2007. The nose was full of minerals and a slight petrol aroma. I normally call this minerality "wet rocks," but I think this time I'll call it "wet sidewalk." The taste was very clean, with minerals and an orange zest flavor. After the last few trips to Orange County, we decided that the Santa Ana Freeway would not be a nice way to end such a nice day. The car agreed, and we took the 91 to the 405. How many times can you say that the 91 Freeway was a great end to your day? It was for us. The Bottle: A beautiful clear bottle shows off the pale color nicely. On the front we learn that the grapes come from the Santa Rita Hills, Courtney's Vineyard, specifically. On the back we learn how wonderful the growing conditions are in Santa Barbara County for Pinot Blanc. They say it has something to do with the long, dry growing season. The wine shows an abv of 13.6%. The Nose: I drank the wine quite chilled (it was a hot day) and as a result, many aromas were not within my reach. I thought there was some melon there, and the minerals made a nice play in the bouquet. The Taste: Very refined, this wine. A clean and crisp feel in the mouth, along with just enough acidity, produces a tendency to gulp. But try to slow down and savor. Good minerals are here, with lots of wet rocks in the first part of the mouthful. Then a wave of pears and apples comes in, very crisp, not baked. Some lightly nutty flavors come in at the end. Very refined, indeed. This is a delicate wine that gives a wonderful drinking experience and a nice finish, too. The Bottle: Crazy labeling has been a hallmark of Bonny Doon product. 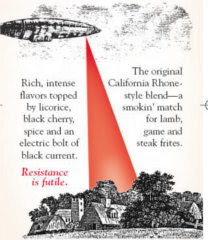 This label tells the story of the vineyard owners in Chateauneuf-du-Pape, who were afraid flying saucers - or "flying cigars" - would harm their vineyards if they attempted to land there. So an ordinance was passed banning such extraterrestrial visitations. Hence the name and the nice artwork on the front, depicting a flying cigar looking for a landing place. Bonny Doon's address is given as "Santa Cruz, CA, USA, Earth," not once but twice. Head Doonster Randall Grahm has a somewhat offbeat sense of humor, for which he is roundly admired. Follow him on Twitter, if you don't already. Nearly all his tweets are worth reading. How did I get so sidetracked? Wasn't I telling you about Le Cigare Volant? Was I just abducted by one? Before I lose the thread again, the abv is 13.5% and the mixture is a fine Rhone style blend of 38% Grenache, 35% Syrah, 12% Mourvedre, 8% Carignane and 7% Cinsault. Let's get busy before those aliens come back. Oh, I got it on sale at Wally's for $24. The Nose: The dark, inky wine has a fabulous smell. I get aromas of red berries, cherries - possibly in the form of cherry cola - and some smokey, leathery licorice. There's a sense of tar in there - a very dark and complex nose. Is that what the aliens have come for? I know I would travel far for it. The Taste: The leathery quality steps in front on the palate. Black cherry follows right behind. That wonderful, dark smokiness lingers on the finish. Dark and delicious, Le Cigare Volant scores one for E.T. Afterword: Thought I'd mention that the 2004 Le Cigare Volant is mentioned in Food and Wine's October issue as one of the "50 classics you must try." 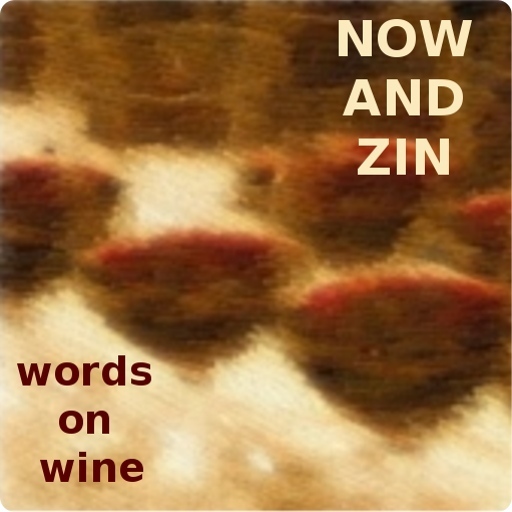 Check out my wine features on Now and Zin WordPress. I also have a wine blog on 661 Magazine. The Bottle: There's a lot of Italian on the label, but even with my limited multi-lingual abilities there's enough English to give me a pretty good idea what's going on. Moscato d'Asti wines come from Italy's Piedmont region, in the northwest near the town of Asti. They are low alcohol wines by law - 5.5% abv. I bought this little gem for $16 in a Glendale wine store my wife and I like to frequent, although far too infrequently. 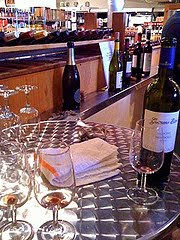 Rosso Wine Shop, 3459 1/2 N. Verdugo Road, has a great selection of Italian wines. Jeff Zimmitti has Spanish, French and Californian in there, too, but we always seem to linger in the Italian aisle. 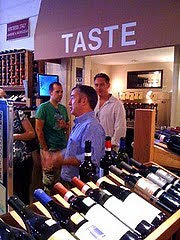 Jeff puts on a nice tasting, too, every weekend. 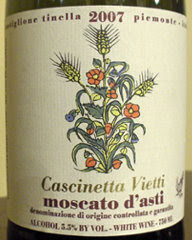 Oh yeah, the wine was Cascinetta Vietti 2007. The Nose: The aromas were a little hard for me to get, as the wine was cold. It seemed to be rather floral and peachy. The Taste: The taste certainly didn't hide, though. It was sweet and fizzy - not a full-fledged sparkling wine, but with enough bubbles to make it worthy of a special occasion, or a special person. The feel is quite full in the mouth, and the fizziness seems to give it a bit of an edge. Honeyed apples and pears were in the forefront, and a rather nutty note made itself known in the pleasant finish. It was a lush delight, and a wonderful change-of-pace wine if you go in for such a thing. And why shouldn't you? Maybe a little explanation is in order. 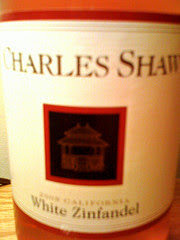 I never really had any inclination to try Charles Shaw wine. That may expose some wine snobbery on my part, or it may show me as a pragmatist who knows what to expect from a two-dollar wine. Anyway, I was given this wine - no, really - by a friend at work who somehow turned up with a couple of cases of different types of "Two Buck Chuck." She offered and I accepted. Opting for what I figured would be the varietal that posed the most challenge for Mr. Shaw, I chose the White Zinfandel over Merlot and Cab. I have always subscribed to the words of Diogenes the Cynic, "I like best the wine drunk at the cost of others." Thank you, Sharone, and to whomever ponied up a couple of double sawbucks for the wine in my friend's car, cheers! I'm about to have my first Charles Shaw experience. The Bottle: Not much in the way of description on this label. It's sourced from Napa and Sonoma grapes, varietal(s) unknown, and carries an 11% abv. The Nose: The wine was a little over-chilled - my bad - and that made it tough to dig out the aromas. It wasn't too bad, though. It was a rather interesting combination of strawberry soda and the bubble gum sticks that used to come in packages of trading cards. I'm expecting a pretty sweet wine here. The Taste: Well, the sweetness was there, but it was muted. I found it to be a peachy kind of flavor like that of a peach diet Snapple. There was also a bit of watermelon on the palate. The acidity seemed a lot better that I expected it to be, but I wouldn't recommend pairing it with anything heavier than a salad. As a sipper, it was quite serviceable, assuming you like your back porch wine a little on the sweet side. I had heard and read so much about this brand that I was actually excited to have the opportunity to try it. I also found myself quite happy about not finding it to be worthless plonk. While it was no award winner in my book, it certainly had a decent quality-to-price ratio. If you're broke and invited to a back yard party, go ahead and pick up a bottle or two of Two Buck Chuck. Cover the labels, and they'll probably be none the wiser. Change is coming in Geyserville, California. You may not see it yet, but you can feel it. The town's excitement - and anxiety - about the very near future is tangible. The tiny community of about 1,600 wine-loving souls is on the verge of significant changes. Geyserville's burgeoning wine industry has produced star-quality product for decades. Now, at a time when wine has taken a much higher profile in our society, Geyserville is on the precipice of cashing in. The citizens of Geyserville have a palpable attitude of hope - hope that change is coming, and hope that the change will be good. They are a small town - downtown is not much more than a wide spot in the road. But the change these people are hoping for is a change that will widen that road, and populate it with more and more businesses to serve the tourism that the change will bring. It would be easy to read a little desperation into all that hope, but that's not how it comes across. These people know what they have - a collection of extremely good wineries and vineyards which are responsible for wines of a very high quality. But they know that is not enough. What they need now is for people to notice. And people are noticing. The former Chateau Souverain was purchased by the Francis Ford Coppola wine empire, and the change has already started there. Coppola is moving his public profile in the wine biz from his Rutherford property to the Geyserville facility, which makes a huge statement all on its own. His Oscars are already there, and his expansion - more on that in a bit - is set for completion by the summer of 2010. Nearby River Rock Casino has expansion plans of its own. Although their hotel plans have been put on the back burner due to the economy, they are at least still on the stove. Just a small economic upturn could be the spark that relights the fire. This sort of change will bring more people to the area, and a higher profile to a wine region that richly deserves a little more notice. As I wandered about the community I couldn't help but notice how friendly and open everyone was. Each winery I visited seemed to be one of the nicest places in the state in which to hang out. I could ask anybody any question and get an answer that was thoughtful and insightful. Everywhere I went, "laid-back" was the prevailing attitude. There wasn't an Italian sportscar in sight the whole time I was there. In fact, it would have been no surprise at all to see a horse tied to a hitchin' post. Geyserville is home to several of the bigger names in winemaking. The old Chateau Souverain now bears the impressive name of Francis Ford Coppola Presents Rosso & Bianco. It sounds like it should be spoken with a fanfare accompanying it. 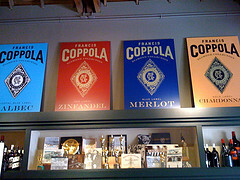 Coppola is known as an idea man. His ideas are being made into reality at Rosso & Bianco, and when he's done, he will have changed the face of Geyserville dramatically. His plans - which are frequently emended as the work progresses - call for the winery to be made into a wine resort, with dining, swimming, lounging and even activities and a play area for the kids. Coppola's changes will attract more people to Geyserville and, with a hotel not included in his plans, will push eager tourism dollars out into the community. Jim Rickards of J Rickards Winery would probably bristle at the mention of the word "boutique" in connection with his operation, but that's the cattleman in him talking. His interests turned from bovine to old vine when he bought his vineyard in the 1970s and began selling grapes to other area winemakers - Silver Oak, Geyser Peak and Dry Creek Vineyards to name a few. His plants date back to 1908 and he has augmented the originals with newly planted clones of old vines. He and his wife Eliza began producing extremely small batches of handmade wines in the early '90s for friends. The reception was enthusiastic enough that they finally decided to start bottling on their own with the 2004 vintage. That move made them a lot more friends. The Pedroncelli family runs the oldest winery in the Alexander Valley, and is one of a handful of Italian-American families in the wine business there. The Pedroncellis were around when the Dry Creek Valley floor was all prune trees. They've done quite well with the grapevines, though. TV legend Raymond Burr didn't really want his vineyards to bear his name. But when Burr passed away his longtime partner Robert Benevides decided it was only right. Today, a very limited amount of top-notch wine is still made with care. One look at the view from the tasting room door and you'll know why Burr didn't mind that long drive up the hill. Stryker Sonoma's showcase tasting room literally puts the vineyard on display, with ceiling-to-floor glass for walls. Murphy-Goode Winery is in Geyserville, although their tasting room is located in Healdsburg. Clos du Bois and Geyser Peak both have names that are familiar to California supermarket shoppers. 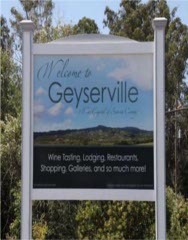 Now, Geyserville is presently about as big as a street corner - at least the downtown business district is. But it's nice to know that you can get plenty of tastes without wandering too far from your accommodations. Locals tasting room was one of my favorite spots. There you can sample from 75 different wines by 11 local producers like Dark Horse, Eric Ross, Atrea and Hawley, just to name a few. They like to pour a "varietal comparison flight," several tastes of one kind of grape from different producers. It's a great way to experience the differences and similarities of various wineries side-by-side. Of course, they also pour what ever you'd like to try, so skip around the extensive two-page tasting menu all you like. Everything you taste is for sale by the bottle in the store. The shop is funded by a collective of the wineries, and the staff knows what they're pouring, so any questions you may have about what you're tasting will be answered. You should also try and get into Route 128 Vineyards and Winery tasting room. Pete and Lorna Opatz opened a tasting room in what was once the parts department of one of the first Ford dealerships in the country. Their 60 combined years of experience with grapes pays off well in their boutique wines. They produce less than 500 cases per year, the standouts being a crisp and lovely Viognier, a lively Zinfandel and an award-winning Syrah which mixes chocolate and blueberry flavors in a delightful way. In the tiny room, you may find art from local Twyla Gettert or even a pairing event with nephew and culinary artist Rian Rinn. Route 128 is a definite "must taste" in Geyserville. Some people consider "wine futures" to be a good investment. I think the time is ripe for some enterprising entrepreneurs to buy futures in Geyserville. Services are needed now, and the need will grow exponentially when the Coppola project and the casino hotel are reality. The town lacks a true grocery market and needs a bakery and a coffee shop that open early. Although Diavalo and the Hoffman House are hard to beat, a couple of extra dining choices would be nice and more lodging will be needed, too. Oh, and that little downtown area could use some sprucing up. Geyserville has great wine. Now it just needs to get dressed up a bit before the company comes over. Keep an eye on the Alexander Valley, and Geyserville in particular. You'll be seeing a lot more of them in the future. 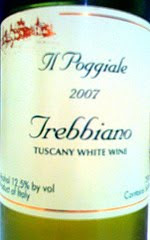 The Bottle: The front label proudly proclaims this Tuscany White Wine to be a product of Italy, with an abv of 12.5%. It's imported by Casa Torelli of Santa Monica. The Nose: There's a lot of minerality in the aromas, producing a fairly pungent nose to go with the pale golden color. A faint fruitiness or even a floral aspect is present, but definitely in a supporting role to the aroma of wet rocks. Nice! The Taste: This wine feels very good in the mouth. It's got a some heft and a good, clean taste that carries a bit of smoky nuttiness along with the minerals and fruit. It's great with Parmesan cheese. The Bottle: The tall-shouldered Bordeaux bottle features a front label with several hints. 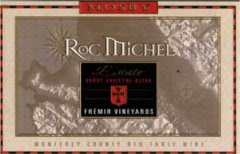 "Rhone Varietal Blend," "Monterey County Red Table Wine," "Fremir Vineyards." It's a Mosby, without the usual art show, though. Too bad. The Mosby label is generally as beautiful as the wine behind it. This wine clocks in with an abv of 13.5%. The back label promises flavors of black cherry, cola and cinnamon. It does not say so on the label, but my tasting room notes mentioned a blend of Syrah and Mourvedre. It goes for $22 at the winery. The Nose: It's lush in here. A bit of alcohol and the faint trace of the oak, but what really comes forward is the cherry that back label told us about. I don't get the cinnamon, but there is some sort of sweetness creeping through, like a candy I can't quite name. Faint traces of, oddly enough, Super Bubble bubble gum. The Taste: That cinnamon is there on the palate, right up front. A good deal of heat, too, upon opening. But it's a fruit explosion in my mouth, tons of cherry cola. This wine really finishes pretty well, too. The nice ruby color is see-through, but not too light. The mouthfeel is full and yummy. This will be nice with a pepper steak or a pork chop. This makes me want to schedule a trip to Buellton. I'm going to want some more of this. Afterword: The second night it was open, the wine began to show some interesting aspects that were not apparent to me upon opening the bottle. It began to display a more vegetal side on the nose and palate, something akin to a bell pepper. This occurrence sort of dialed the sweetness back a notch and replaced it with a darker, more insidious character. It's still a very good wine. It seems to get more complex the longer it is open.